Princess Rose and her eleven younger sisters are enigmas to their father, the king, and all of their servants. They are charming, lovely, and kind girls, yet they refuse to say why almost every morning their dancing slippers are worn to rags. And they continue their silence, despite threats and guards who are with them constantly. Galen is a young soldier turned gardener who can't get Princess Rose or the mystery of the princesses' dancing slippers out of his head, and despite the deadly consequences that have befallen others who have attempted to learn the princesses' secrets, he is determined to help the sisters. And with his ingenuity, the help of a few magical objects, and true love, a simple gardener just might be able to do what no prince can. 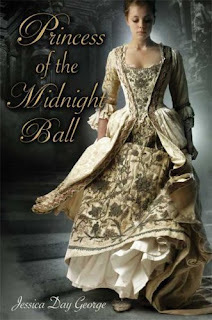 Princess of the Midnight Ball is a lovely fairy tale retelling of "The Twelve Dancing Princesses" and the perfect escape from your everyday world. Rose and Galen's world is loosely based on a historic Europe with a dash of magic: Galen receives magical assistance in his quest to help the princesses, magicians exist in hiding, and princesses are under curse that requires them to travel beneath the palace to an evil realm with dark half-human suitors. The action unfolds quickly as the book bounces back and forth between Galen and Rose's perspectives, and a romance begins to slowly blossom. George has done a very good job with this retelling: it's a fast-paced and fun, and just complicated enough to be engrossing, but not so much that it hasn't lost the wonderful fairy tale-like quality. She even manages to throw is a few little twists at the end, making for a delightful ending to a very engaging and magical book. Cover Comments: This cover was what first drew me to this book. I love any beautiful, detailed dress, and this one definitely captures the eye. I like how the girl is caught mid stride, and her gaze is downcast. It seems fitting considering the curse she is under. This one is out in paperback! I love this book and its sequel "Princess of Glass". They are both great retellings of old fairy tales. I loved this book so much. Definitely one of my favorite fairy tale retellings. I agree with what you said about the balance of the book, expanding on the story but keeping the lightness of a fairy tale.